Brian Kelly is shaking it up at Cincinnati. Kelly, who arrived last fall, has already told the local media to shape up. 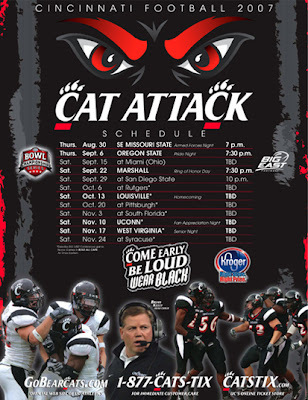 Now he will try to work his magic with the Bearcats, who play host to Oregon State in a Thursday night game on Sept. 6. Poster schedules: Florida State, Wyoming, Vanderbilt, Pittsburgh, Arkansas, Kent State, Navy, Duke, Purdue, Missouri, South Carolina, Wake Forest, Middle Tennessee, Brigham Young, Syracuse, Louisiana Tech, South Florida, Colorado, Southern Mississippi, Washington State, Kentucky, Houston, Toledo, Iowa State, North Texas, Arizona State, Minnesota, Clemson, North Carolina State, West Virginia, East Carolina, Nevada, Georgia Tech, Florida, Oklahoma, UCLA, Kansas State, Utah, Stanford, Auburn, Northwestern, Iowa, Texas El Paso, Penn State, Ohio, USC.